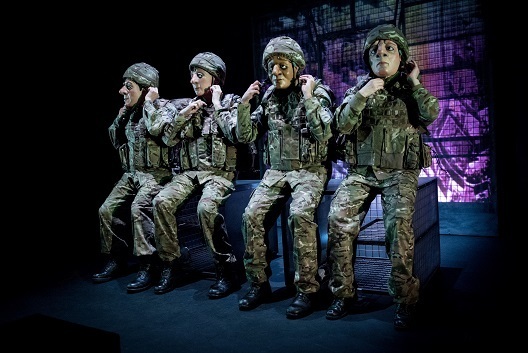 Full mask theatre company Vamos has tackled some thorny issues in the past including the decline of the NHS, dementia, grief and loneliness and now it turns its attention to post-traumatic stress disorder in the military. To do so, A Brave Face brings us the story of Ryan, a teenager from Middlesbrough who, together with his friend Ravi, joins the army. Initially it's all an adventure but once they are sent to Afghanistan the adventure becomes a bitter reality. Here a series of incidents results in the death of Ravi and the onset of combat stress in Ryan. Back home, we see Ryan, who has a loving mum and sister, attempting to live a normal life while haunted by his memories of the past. A Brave Face has been created by Vamos founder Rachael Savage following two years of research including harrowing interviews with former soldiers. This background work ensures Ryan's story has a feeling of authenticity. While some of his behaviour may appear eccentric, much of it is based in stories told to Rachael by men and women experiencing post-traumatic stress. Vamos has full mask theatre down to an art so that interactions, emotions and drama are all told without words but through gesture and movement. And while the company is exploring combat, it is also exploring relationships and how they can be affected by the after effects of war. Ryan, played with great sensitivity by James Greaves, has a particularly close relationship with his younger sister Katie, played as a fun-loving girl with pig-tails by Joanna Holden. And, when he meets Afghan girl Khatera, also played by Joanna Holden, he is able to build a friendship with her because of his strong understanding of his sister. Angela Laverick plays the part of Ryan's mum, a woman who is initially proud but fearful for her son and then is desperate to support him but struggles to know the best way to do so. Her attempts to find him help from health experts only leave Ryan more confused than before he began the process. Performed at Birmingham's mac and lasting 75 minutes, A Brave Face is in some ways a very simple tale but it also explores the bonds between fellow soldiers, civilians and with families back home, giving it a multi-faceted dimension. 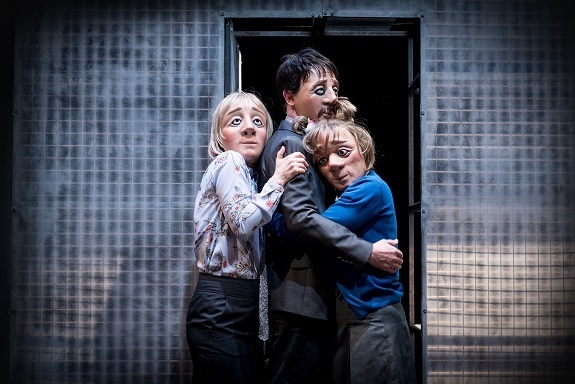 A co-production with Mercury Theatre Colchester and a co-commission with London International Mime Festival, A Brave Face takes us inside an issue which both the military and society generally has struggled to fully comprehend. And in doing so, it also gives us a story touched with humour and humanity and a cast of memorable characters. For information on the full tour see here.